Colt M4 lower with a Colt HBAR rifle length gas upper chopped. A1 or A2 stock to follow at some point in near future. Sweet, I love me a full length dissipator. 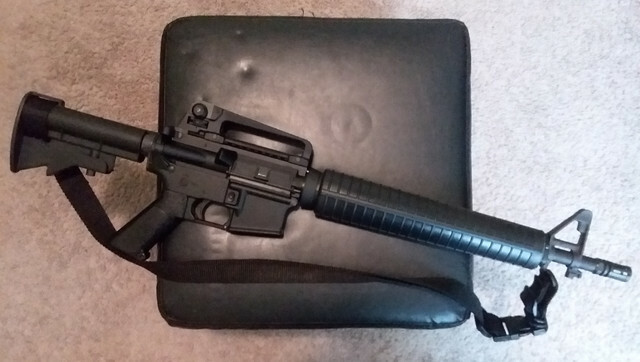 I did a delton kit with a car buttstock, Colt a2 handguards and A1 grip. ^^ Great combination, Nacho Man. Would look great with a 20 rd USGI mag. A1 stocks are not as easy to find, but I like the slightly shorter length over an A2 and to me is worth the effort to get. That Colt dissy would look sweet with an A1, or A2. Hear ya big guy. A1 is the way to go. I have one on my Aero Classic. Last edited by Gaddywack; 02-12-2019 at 01:30 PM. Actually not that hard to find. This is my #1 go to place. I have orderd multiple sets from them. I know you can A1's, I replaced my PSA 18" kits A2 with an A1, but I don't remember where I got it from. I was just saying they aren't as easy to find. That Cavalry one looks like a decent deal.